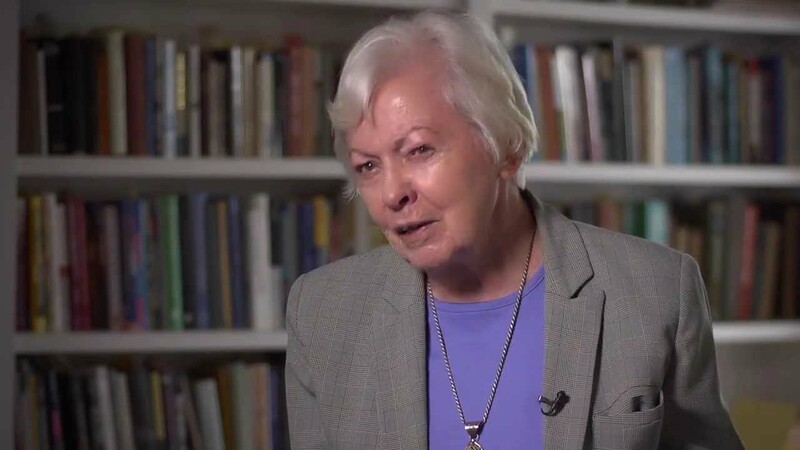 Nel Noddings (1929 – ) has made significant contributions as an educator, philosopher, writer and academic and is probably best known for her ideas about the ethics of caring in education. She has been described as one of the premier philosophers of moral education in the English speaking world today. In “Education and Democracy in the 21st Century”, she builds on John Dewey‘s work to reinterpret education’s aims and curriculum for the 21st century. She sees education as having multiple aims contributing to three areas of life: home and family, occupational, and civic. The text includes critical examination of the liberal arts curriculum, vocational education, restructuring secondary school, extracurricular activities, national and global citizenship, critical thinking, and moral education. Have you come across Noddings’ work? What do you think of her writing and ideas? Any other resources or links to recommend? 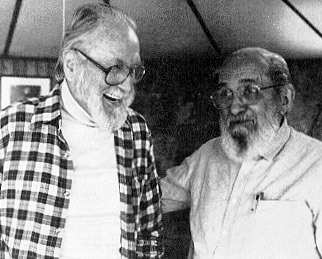 Myles Horton (1905-1990) put his thinking about adult education for social purpose into practical action and left a legacy that lives on in the Highlander Center in Newmarket, Tennessee. Highlander serves as a catalyst for grassroots organizing and movement building in Appalachia and the South. We work with people fighting for justice, equality and sustainability, supporting their efforts to take collective action to shape their own destiny. Rosa Parks attended workshops at the Highlander before her iconic bus protest on December 1, 1955. Parks, an African American refused to give up her seat for a white man on a racially segregated Montgomery City bus on her way home from work. Her actions led to profound and lasting change. Martin Luther King also attended the Highlander Folk School, where the civil rights anthem, “We shall overcome”, first became popular. Myles Horton developed citizenship schools for African American Sea Islanders in South Carolina. These spread throughout the southern USA. They helped 100,000 African Americans to become literate. This in turn qualified them to register to vote and was integral to growing the USA’s civil rights movement of the 1960s. Horton had an immense influence at Highlander but many other inspirational educators worked there or had links. A letter of Helen Lewis‘s 90th birthday recollections of Highlander is on the Center’s website. It shows the Center’s reach and describes connections forged between Appalachian and Welsh miners. Whose exchanges about education inspire social change on a similar scale today? Who is “making the road by walking” in 2014 and whose conversations would you like to see captured? Stephen Brookfield is widely respected as a leading contemporary thinker in adult education. His academic research and writing is informed by his experience of teaching adults in England, Australia, Canada and the USA. Born in Liverpool in 1949, he has written extensively on adult learning, critical thinking, discussion and critical pedagogy. His work should be on the reading lists of all adult educators who are committed to reflective practice and critical pedagogy. These four lenses bring together the processes of self-reflection, student feedback, peer assessment and consideration of relevant academic literature. They sum up various elements of critical thinking that reflective practitioners bring to their teaching with adult learners. Giulia Forsythe, who tweets as @giuliaforsythe, has produced this wonderful visual summary of Brookfield’s 1995 book, “Becoming a Critically Reflective Teacher” (Jossey-Bass Higher and Adult Education). It would make a fantastic poster and is shared with Giulia’s kind permission. This blog scratches the surface of Brookfield’s work. Have you got any comments or observations about the impact of his work on your professional practice, your experience as a student, or pointers to other relevant resources? Twitter isn’t all about what people had for their lunch. This week Tim Taylor (@imagineinquiry) tweeted his summary of a book on Lev Vygotsky’s work. Although the focus is on children’s education, the Russian psychologist and educational thinker’s work is relevant in adult learning too. Vygotsky suggests that the experience of learning on an individual basis is not as rich or deep as learning alongside someone who is more knowledgeable about a subject and that learning should have a social context. It’s interesting to think about how online learning might be designed in response to this and how children’s experience of school-based education might affect their later attitude towards learning as adults. Reading an interesting introduction to Vygotsky ATM. Here is an overview of his key ideas on education..
2. Higher mental process, such as problem-solving, have a social origin. 3. Thinking must be understood developmentally (historically) at both the individual & cultural levels of analysis. 4. Mediational means of various kinds are crucial in human, social, & psychological development. 5. Active subjects create themselves through their social actions. 8. The zone of proximal development = what a child can do independently & what child can do with assistance from others who know more. 9. Invisible mediation (ordinary life) is always related to visible mediation through teaching. 11. …ch advance themselves to higher levels of psychological functioning. 14. Education in classrooms must be considered not natural, but cultural. Cultural laboratories of human development. 16. Therefore in the ZPD teachers are also learners, and students are also teachers. Thanks to Tim for his generosity in sharing the notes from his reading and for introducing others to Vygotsky’s work or providing a refresher. There is a range of opinion about Vytgotsky’s views and his theoretical work is often compared and contrasted to that of Jean Piaget. Do you have any further thoughts about Vygotsky’s ideas or links to other resources? Learning facts can be a crucial backdrop to learning for understanding, but learning facts is not learning for understanding. Teaching for knowledge or teaching for understanding? This is a hot topic for some educators who use social media. 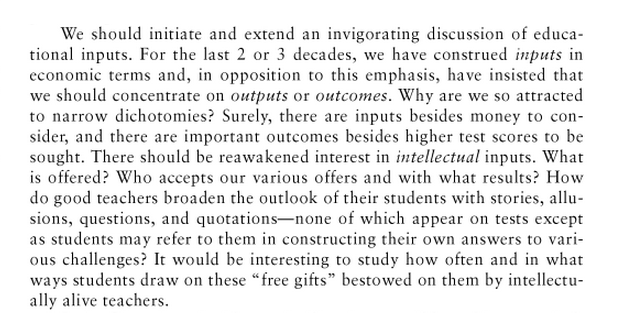 It can become a rather abstract and artificial debate at times but it’s important to think about how ideas of ‘knowledge’ and ‘understanding’ influence curriculum design and day-to-day practice in teaching, learning and assessment. Is the curriculum relevant to the students? Can students use the knowledge being taught? Do students understand the knowledge being learnt? Generative Topics: These topics are connected to students’ interests and experiences. They can be learned in many different ways and build on previous topics. Understanding Goals: These are statements or questions describing what students should aim to understand during a course. Performances of Understanding: These are activities that require students to apply their knowledge in new ways to show their progress and their grasp of the Understanding Goals. Ongoing Assessment: This is the process of continual feedback to students about their Performances of Understanding in order to improve them. The framework goes beyond “show and tell” and encourages students to “grow and show” their understanding and application of knowledge. There’s more information about the Teaching for Understanding project here and you can find some practical workshop resources here. 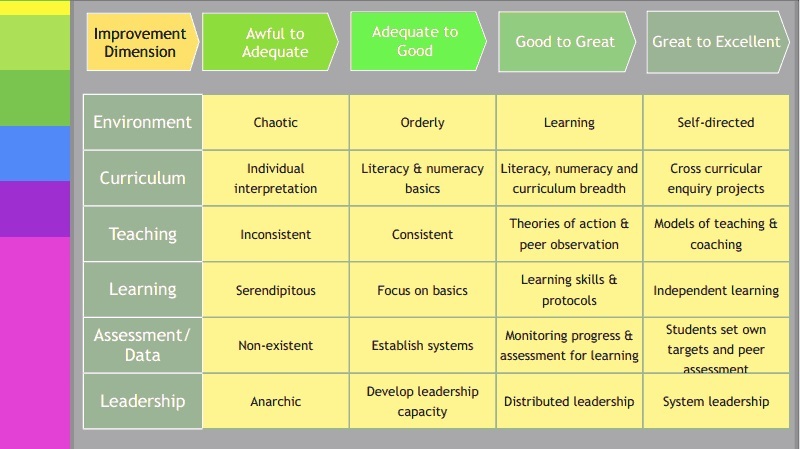 How does this framework fit with practice in adult learning? Where does ‘knowledge’ fit in? Thoughts? Wayne Craig is a current educational thinker with an international reputation. He works with scholars, design experts, reformers and thought leaders around the world. He’s a well-known system improvement expert. He and Professor David Hopkins, a visiting professor at Melbourne University, are credited with having led a large-scale initiative to raise achievement and improve outcomes for school students across the Northern Melbourne Metropolitan District of Australia. 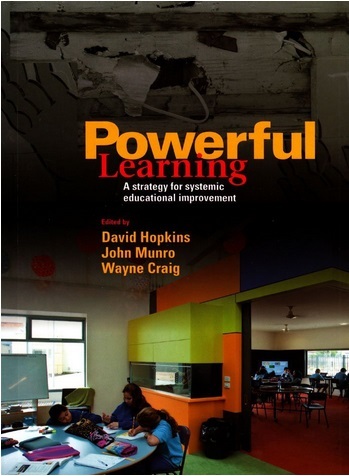 He developed and co-authored Powerful Learning: A Strategy for Systemic Educational Improvement. Some of his work is easily accessible online and the presentation Curiosity and Powerful Learning: Going Deeper Again has some thought-provoking insights and evidence. 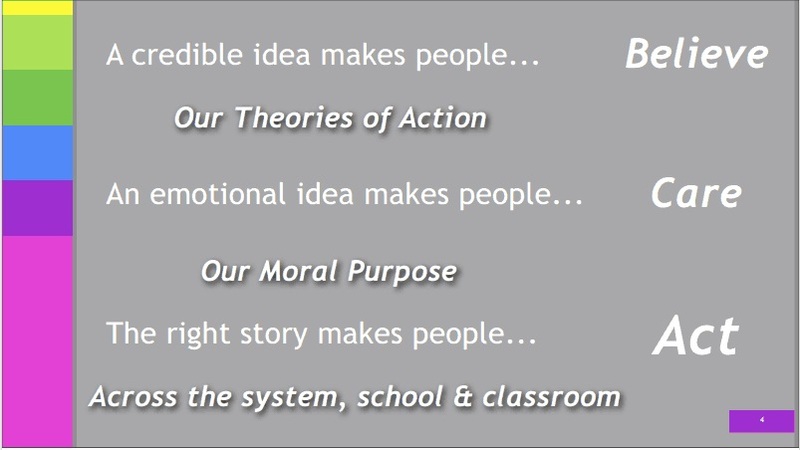 It’s well worth clicking this link if you’re interested in the relationships between curiosity, theories of action, moral purpose and system improvement in education. The slide below gives a flavour. Wayne Craig has generously given permission for use of the material copied here. He’s a pragmatist and has applied these principles in systems, linking teaching, learning and assessment to overall system improvement. The focus is on school system improvement, but many of the principles are transferable to adult learning, especially in dispersed community settings. What do you think of his ideas? How might they influence practice in adult teaching, learning, assessment and systems? Sir Ken Robinson divides opinion. His stint as a castaway on BBC Radio 4’s Desert Island Discs last week prompted a wave of responses from educators. You can hear the broadcast online here or download a podcast here. You can get a flavour of his thinking in this RSA video. Some commentators claim that he’s an ego-driven self publicist, popularising his arguments through charm and persuasion. Others see him as a brilliant creative visionary who can save education from a system that isn’t working for far too many people. Of course, neither of these extremes of opinion is mutually exclusive and both are simplistic. One is about assumed motivation – and it can only ever be assumed – and personality and the other is about promoting a single approach to teaching and learning. I heard him talk to a comparatively small audience several years ago. There was no doubting his charisma but his arguments, to educators and policy makers, were also very compelling. The quote below is typical and especially relevant to adult and community learning, where we often work with people who didn’t flourish or find their skills and confidence before they left school. How do we decide on the validity of his theses and respond to the counter claims of his critics? I’m with John Dewey on this. We all filter evidence through the lens of our personal experience. I’ve read and listened to some of the pros and cons relating to Sir Ken’s approaches and tried to be objective but personal experience of learning and teaching tells me that he talks good sense. Are people suspicious because he does so with such panache? Being a good communicator isn’t the same as dumbing down. What do you think about the RSA video and Sir Ken’s vision for creativity in education?